Steroids and their users are no strangers to sensationalised media reports, however their use is increasingly being placed under the spotlight. From court hearings for the London Bridge terrorist attack which claimed the assailants had taken dehydroepiandrosterone prior to their killing spree, to warnings from health care professionals that with up to 1 million people in the UK taking anabolic steroids a public health emergency is imminent, it appears a perfect moral panic has been created. This has been particularly evident as many harm reduction and pro-legalisation advocates have placed an emphasis on dealing with drugs more frequently associated with the ‘night time economy’, culminating in a disturbing imbalance in the reporting of steroid related issues. Therefore, it is vital that progressive drug policy advocates do not turn a blind eye to the treatment of steroids and their users in the media, thus ensuring any discussion on the reclassification of the substance is not a one-sided affair. 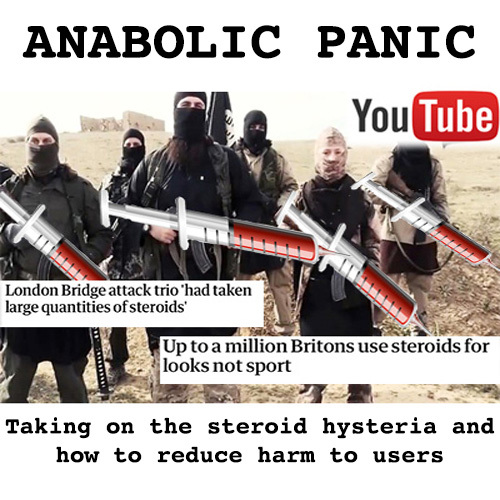 While tabloid newspapers and even respected news outlets emphasised the role played by steroids in the killing of eight innocent people by Islamic extremists, the reality is that the overall harm caused by anabolic steroids is comparatively low in relation to commonly used illegal and legal recreational drugs. The 2010 “Drug Harms in the UK: A Multicriteria Decision Analysis” study into the harms caused by twenty substances, gave anabolic steroids a ‘harm score’ of 10, placing it behind Ketamine (15), Cannabis (20), Tobacco (26) and Alcohol (72). Nonetheless, it is important to contextualise these findings, as Prof. David Nutt noted, the legal status of drugs will have an impact on harm levels, with the availability of alcohol going some way to explaining its ranking. Likewise, if a drug were to see its number of users increase it could also expect to see its harm level increase as the ‘harm score’ takes into account indicators such as ‘economic cost’, ‘environmental damage’ and ‘crime’. As such, it would be feasible that anabolic steroids would now, eight years on from the study, have a marginally increased ‘harm score’. Certainly, with a surge in the amount of users over the past decade it would be reasonable to expect a slight increase in the economic cost of the substance owing to the ill effects on the health of users and the subsequent costs this has on the NHS. However, the continuing reports of an imminent steroid-induced public health emergency are misleading and unhelpful in attempts to reduce harm and ultimately stigmatises users. So how can the rise in steroid use be addressed within the current legislative framework before it becomes a major public health concern? As with any drug, legal or illegal, the reduction of harm must begin with information sharing and the educating of users. State and charity run NSPs (Needle Syringe Programmes) offer a natural avenue for providing users with an understanding of the side-effects of anabolic steroids and how these can be reduced. The focus of education should revolve around ensuring users have regular health checks and highlighting the risks of poly-drug use. The findings of a 2017 study into the use of IPEDS (image and performance enhancing drugs) emphasises the need for this type of education, as its results show that regular alcohol and cocaine consumption is common amongst steroid users – a combination of drugs which place stress on the cardiovascular system, as well as the liver. Another venue which has been utilised by steroid users to provide information to fellow users is YouTube. While YouTubers, such as Thomas Maw, are not health care professionals their steroid information videos play an important role in informing users of both the practical use of anabolics – such as how to inject – to the side effects experienced and how to address them, but they also play a key role in de-stigmatising users. However, in recent months YouTube has begun to scrutinise steroid-related content more robustly, with accounts which discuss the topic being issued warnings and viewing numbers for steroid related videos falling dramatically. Perhaps understandably YouTube is concerned that its platform is being utilised by steroid users to provide what it views as ‘unqualified’ advice to fellow consumers and the potentiality of being implicated in drug related deaths. Although, it would be wrong to suggest that P2P (peer to peer) information sharing cannot play a role in harm reduction. P2P information sharing is currently being utilised for substances more commonly associated with the ‘night time economy’. Pillreports.net is a database created by an online community of Ecstasy users based on both ‘subjective user reports and scientific analysis’ which provides information to its membership regarding the content and safety of Ecstasy pills. Certainly, with the production and supply of anabolic steroids being dominated by black market imports and domestic underground laboratories – where the danger of contamination is a real issue due to unregulated production practices – P2P information sharing can play a crucial part in ensuring the harm faced by users is reduced. Indeed, some underground laboratories have started to take precautions in ensuring the safety of their consumer base, with vials of anabolic substances being stamped with codes which can be inputted into their respective websites and subsequently validated as official products. While this practice may show that laboratories are willing to make themselves accountable to their consumers, it does not go far enough and may lull users into a false sense of security. Instead, with an estimated 1 million users of anabolics in the UK it is vital that substance testing is made readily available to this group to guarantee their safety from contaminants. The Loop has blazed a trail in a similar domain with its efforts to reduce the harms associated with recreational drugs at nightlife venues, but an equivalent organisation dedicated to the safety of IPEDs users is notable in its absence. As efforts to safeguard users of recreational drugs from unintended harm intensify, it is important that consumers of anabolics are not left behind due to the ‘hard man’ stigma attached to their use.